When astrologers are unable to calculate a birth chart with an accurate time of birth, 12:00 noon is used. However, there are certain factors in the chart that can not be determined. The Moon is one of these factors, especially if it is at the beginning or the end of a zodiac sign. Depending on her time of birth, Melania’s Moon is in either Sagittarius or Capricorn but my guess is in favour of Sagittarius, which I’ll explain a little later. Melania is a Taurus and being ruled by Venus, the goddess of beauty and seduction, it’s not surprising that she has made a fortune from her looks as a fashion model (Taurus also rules money, by the way). Of course, Melania is President Donald Trump’s wife and the pair do share some profound astrological connections. 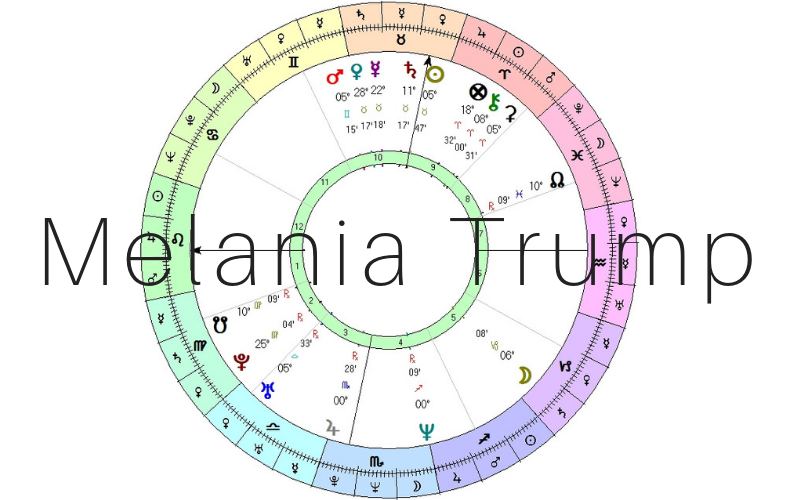 Firstly, Melania’s stellium in Taurus culminates at the zenith of Donald’s chart, indicating that she plays an integral role in his public life. She may also have more to say behind the scenes than most would believe, with her natal Mercury heading the pack. Additionally, Melania’s Mars (drive, sexuality, motivation) meets up with Donald’s Ascendant (personality, image and how he presents himself to the world). If two angles, in this case the Ascendant and Midheaven, are activated by both players, it reveals a significant attraction and fated roles to play in each other’s lives; both pushing each other to fulfil their destinies, especially in terms of their public personas. As previously mentioned, I suspect that Melania was born earlier in the day, giving her a Sagittarian Moon rather than a Capricorn Moon because this would place both Donald and Melania’s Moons in the same zodiac sign, indicating a mutual understanding of their emotional make-up, similar expressions of feeling and the foreign connections they experience together as President and First Lady. Of course, Melania herself is the second First Lady to be born outside the United States, again marking the international qualities of a Sagittarian Moon.